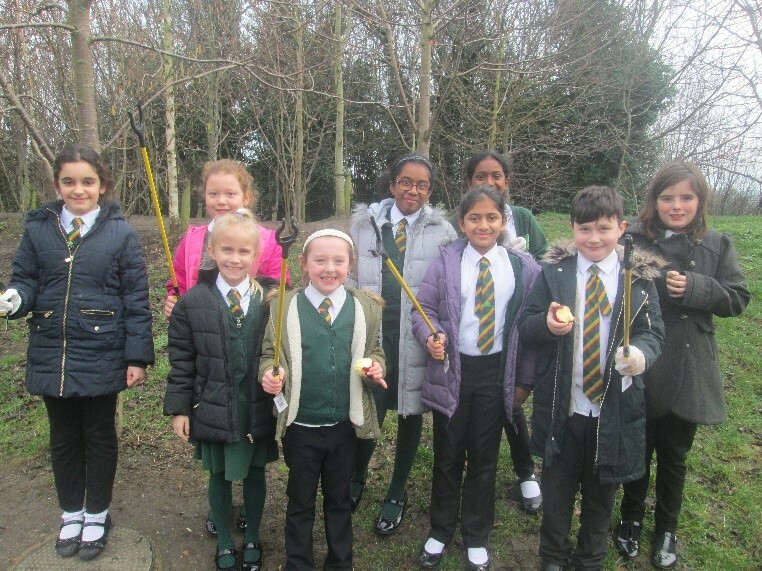 This term, the Eco-Council have continued to keep the site clean and tidy using the litter pickers. We have been a bit disappointed by the amount of rubbish that is dropped each day and would like to please remind people to make sure that all waste is put carefully into the appropriate bins. We are however very pleased with the reducing amount of food being wasted as the food bins are definitely less full than they were last term. Please continue to eat the food that you have been given and talk to your parents/carers if you are finding that you have too much to manage. Can we please also remind you that the food bins are for food waste only and any plastic, wrappings or bags should not be placed in these bins. We have also been looking at energy use in the classrooms. This has been especially important over the last couple of weeks because it has been cold in the mornings and then lovely and sunny in the afternoon. As a result, we have needed the heating on, but then needed to open windows and doors to enjoy the warmth. The Eco-Council have been checking that, if doors and windows are open, the thermostats are down and that lights are off when the rooms are empty. We can all make little changes to help save energy, money and our planet. Next term we will be looking at water use and question whether we are always using this vital resource responsibly. As always, if you have any ideas or suggestions, please talk to a member of the Eco-Council. 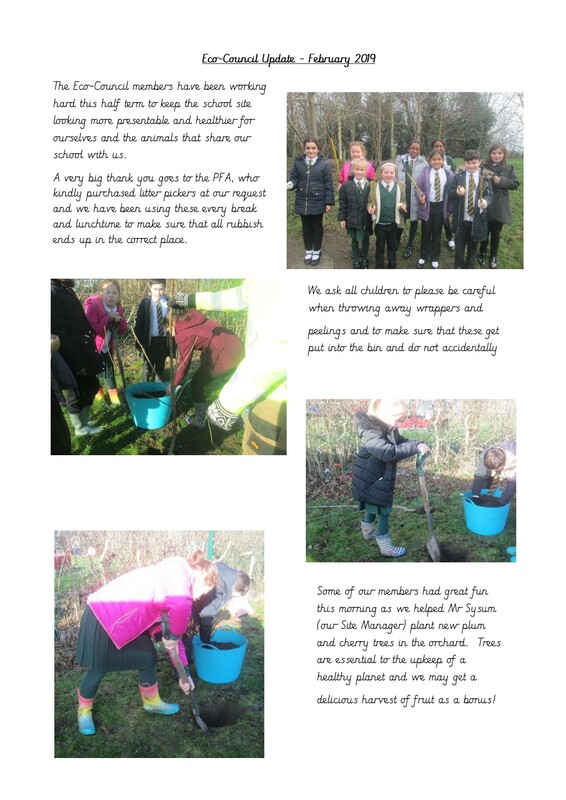 Eco-Council News Autumn Term 2018 It was a busy first term for the newly appointed Eco-Council. Our first project was to put recycling bins in place around the school playgrounds to collect and recycle food waste. We have been carrying out checks of these at break times and are pleased to report that, in general, these are being well utilised. However, there have been a few issues with these bins not always being used correctly. We have found plastic wrappers, lots and lots of whole food items thrown away and some food still being put into general waste. Can we please remind you all that as a school community, we are all responsible for the care of the school and our planet. You can play your part by remembering these simple rules: ? All food waste to go into the separate bins. ? All wrappers and plastics to be removed and put into general waste. ? If you are not able to eat all your food each day, please speak to your parents or carers about the amount of food you are bringing to school. We will continue to look at how these bins are being used and hope to find that a lot less food is being thrown away and that only food is being put into these containers. Next term we will also be looking at litter around the school site and setting up a rota for this to be collected. We will also be investigating our energy use and whether we are turning off lights and shutting doors now that our school is being heated. If you have any ideas for how to make our school more Eco-friendly, please send these into the office marked for the attention of the Eco-Council. Thank you for all your help.